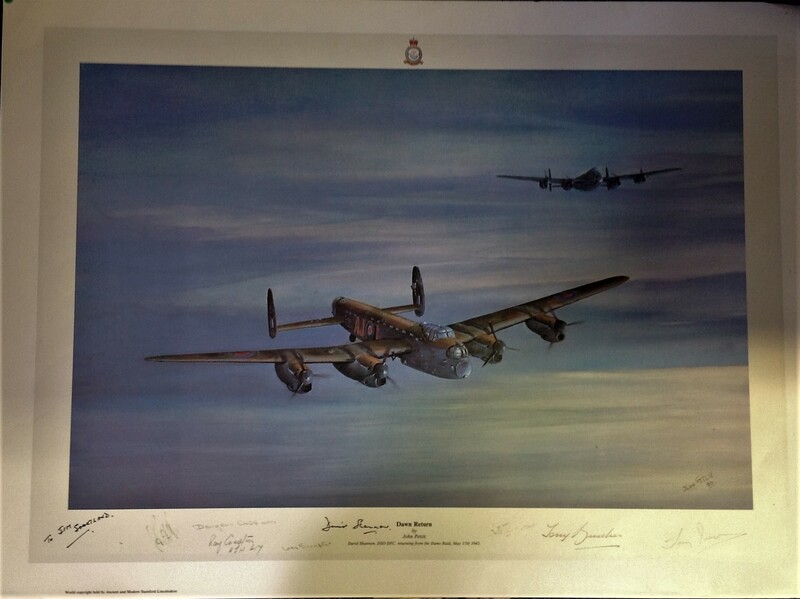 Dambuster World War Two print 19x27 titled Dawn Return by the artist John Pettit pictured David Shannon DSO DFC returning from the dams raid May 17th 1943 dedicated to Jim Shortland by David Shannon signed by 8 bomber command veterans including David Shannon, Douglas Webb, Ray Grayston, Bill Townsend, Tony Burcher and Tony Iversen tape mark around one edge image and signatures not affected. From the collection of 617 Sqn aviation historian Jim Shortland. Good Condition. All signed pieces come with a Certificate of Authenticity. We combine postage on multiple winning lots and can ship worldwide. UK postage from £3.99, EU from £5.99, Rest of World from £7.99.